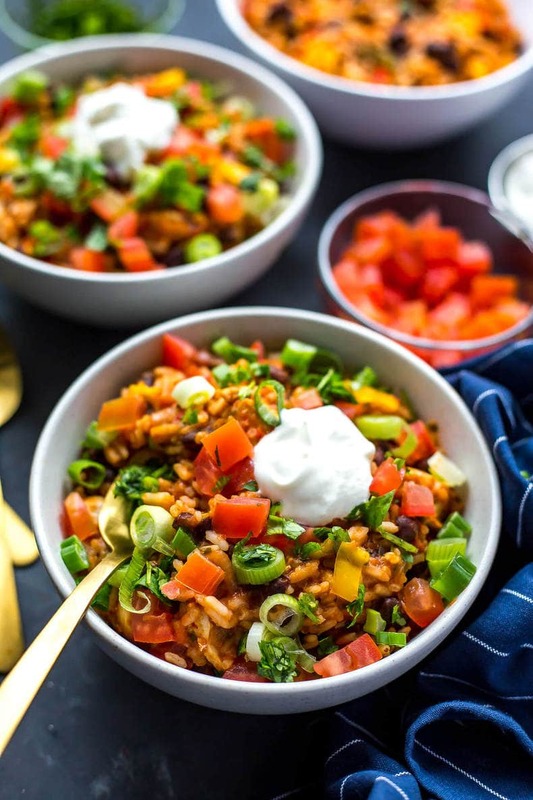 Dump all ingredients except for plum tomatoes, scallions and sour cream in Instant Pot, making sure to add the rice last. Ensure you add rice on top of everything else or rice will burn the bottom of the pot. Set to manual and pressure cook on high for 4 minutes. Instant Pot will take about 10 minutes to pre-heat and then the 4 minutes to cook. When complete, press cancel and do a quick release of the steam, waiting until the pressure gauge drops back down and the lid is safe to open. Remove lid, stir contents well and divide among 6 bowls. Top with plum tomatoes, scallions and sour cream (I also sometimes add cheese, lettuce, more cilantro, avocado and whatever other veggies I have on hand). Serve and enjoy! Update: upon further testing, the bell peppers turn out much fresher if you cook everything on high pressure, then stir the peppers in after. It depends on the texture you want!